The high frequency indicators are continuing their post-shutdown bounce. Click on the link to read the article. Computer issues in California have bedeviled the weekly initial jobless claims reports since the bginning of September. As I did last year with regard to Superstorm Sandy, we can arrive at a good estimate the "real" initial jobless claims have been, by comparing the unadjusted average for the other 49 states this year vs. last year in the same week, and projecting this year's "real" number by assuming that the percentage of claims in the other 49 states are the same percentage of the total this year as they were last year. October 5 and 12 were the two weeks during which federal workers affected by the government shutdown applied for unemployment insurance. In September,California's problems probably resulted in an underount of -53,000 claims by the above calculations. Close to 50,000 of those claims have been made up in the last two weeks. We might have one more week of distortion, and hopefully that will be the end. Thanks to Barry at the Big Picture for this. The oil choke collar -- the dynamic by which an improving economy caused gas prices to rise to the point where they choked back consumer spending on other items, which weakened the economy, which in turn caused gas prices to decline -- in other words the mechanism that acted as a governor restricting growth -- has disengaged in the last few months. Gas prices are now 13% lower than they were a year ago, and even lower than they were two years ago at this time! 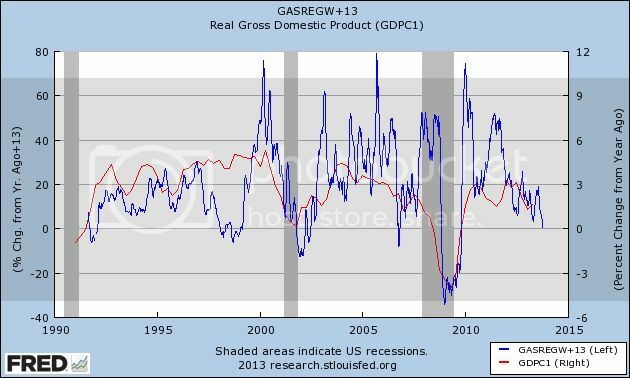 In each time this has happened it has been a good sign for growth, either immediately, or at least in several quarters (real GDP YoY growth shown in red). In fact I believe the decline in the price of gas from $4.25 a gallon to $1.50 a gallon in the second half of 2008 is one of the big reasons that the great recession bottomed out in midyear 2009. One of the things I've been pointing out in my Weekly Indicators column for months now is that, left to its own devices, the economy looks like it wants to grow more in the near future. The disengagement of the oil choke collar is a potent piece of evidence in support of that thesis. 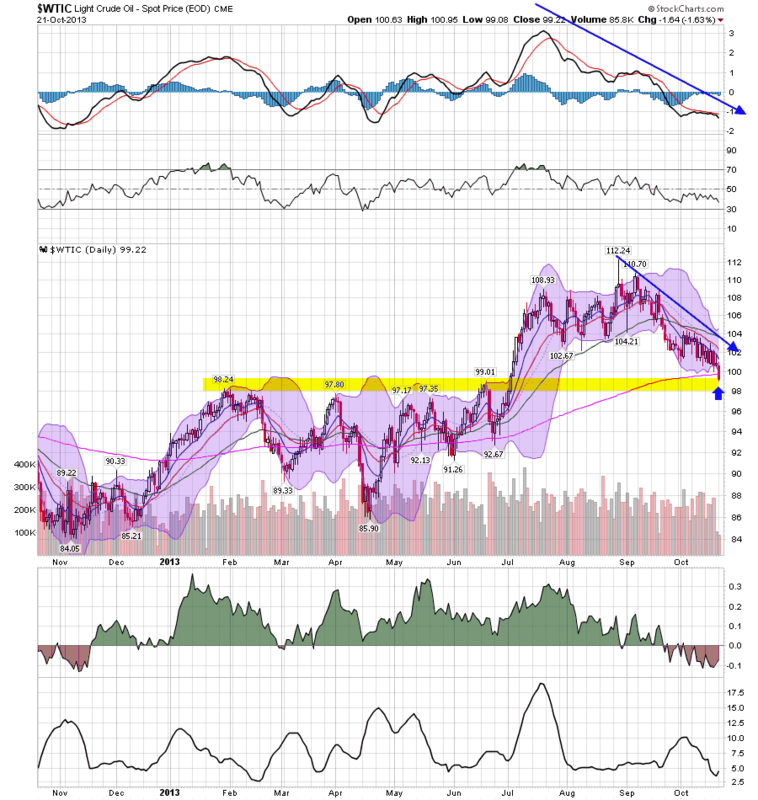 Are Bonds Signaling A Weak Fourth Quarter Stock Market Performance? The sigh of relief felt in the U.S. bond market as Congress temporarily shelved its fiscal standoff is giving way to a more worrisome market signal: the economy isn’t as strong as we thought it would be by now. The Treasury market has been on a tear in recent days, beginning in earnest as Senate leaders announced a deal Wednesday to reopen the government through January and allow the Treasury to continue borrowing through February. The benchmark 10-year note 10_YEAR 0.00% yield, which falls as prices rise, is down roughly 15 basis points from its close on Tuesday, on track for its lowest closing yield since August. Strategists say yields are likely to stay in this range in the near term, in contrast to the sharp yield climb that characterized much of the summer. “We’re pretty comfortable saying the 10-year won’t see 3% this year. At this stage, the September yield peak will be the high of the year,” said Ian Lyngen, senior rates strategist at CRT Capital Group. Treasury yields, which serve as benchmark rates, push lower when economic and political uncertainty prompt investors to buy into the security of the government debt market. When the Congressional standoff came to a close this week, strategists thought yields would rise as the abating political uncertainty turned investor attention away from Treasurys and back toward riskier assets. But yields made a U-turn and moved in the opposite direction, catching many market participants by surprise. It’s one sign that the debt ceiling debate had simply masked, and possibly contributed to, a slowdown in economic growth. Before looking at the chart, let's review some bond market basics. In theory, bond prices are near their highest (and yields the lowest) right at the end of a recession. At this point in the economic cycle inflation is at its lowest and equities are offering weak capital gains potential. So, investors are looking more for the "sure thing" -- interest payments, which are more attractive because the bite of inflation is so low. As the economy expands, investors leave bonds for riskier assets, lowering bond prices and thereby increasing bond yields. One of the more difficult part of looking at the markets during this expansion has been the Fed's QE program, which have put a permanent bid in the bond market, thereby skewing the predictive power of this market action. However, with the Fed talking of tapering its QE program, one could argue we're seeing a return of the predictive power of the bond market. The Fed began its tapering take in the late Spring, which explains the drop in the IEFs from 108.4 to 98.45, or a drop of 9%. However the bond market caught a bid during the budget showdown, printing a rounding top pattern from mid-September to mid-October. But since the end of the stand-off, bond prices printed a gap and moved higher. “Since the end of the debt ceiling conflict, the focus has shifted in financial markets to what the economic implications would be,” said Jeffrey Rosenberg, chief investment strategist for fixed income at BlackRock. “And it came at a time when the economy had been slowing down, when there was disappointment in what was at the time heightened expectations of better second half growth. Rosenberg puts the turning point in economic growth around the beginning of September, when the nonfarm-payrolls report missed expectations. Since then, many indicators have begun to slip. While not crashing, employment numbers haven't been printing gangbusters growth, either. As the Fed noted in its most recent Beige Book, the expansion continues to be "moderate." Durable goods have been OK as well. And now we have the fiscal drag related to the debt deal shenanigans in Washington. This week will be the first full trading week post-debt deal. 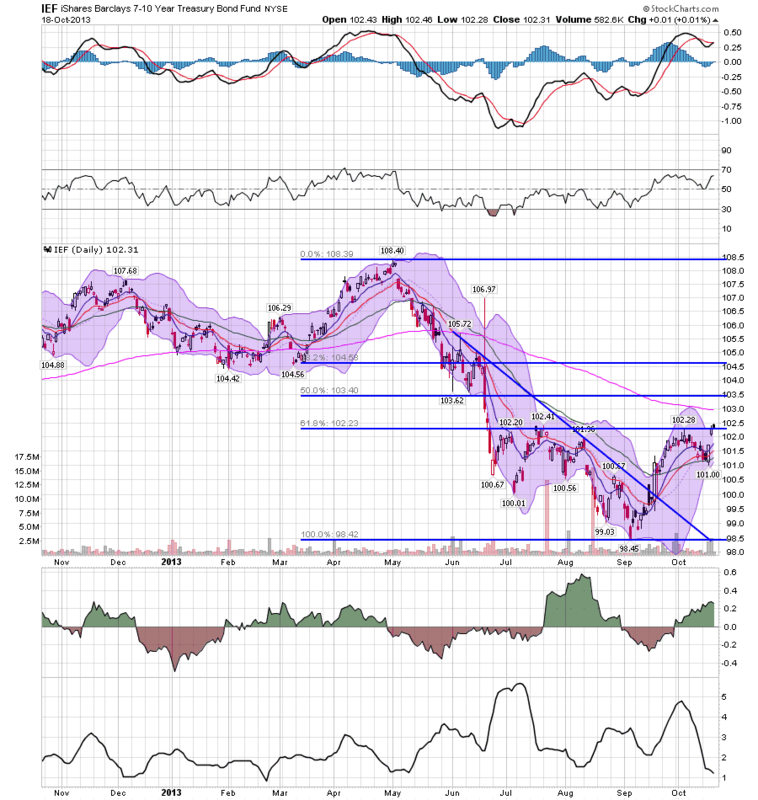 The market action should fill begin to fill in a number of gaps as the week progresses.